When you have to decide between work and play… Do both. With a John Deere Gator, you can have your cake and eat it, too. It loves the great outdoors as much as you do, and it’ll work hard so you can play harder. When a Gator calls, answer to it at United Ag and Turf. so you can bring more people on adventures. Superior terrain capability lets you take on any trail. Extra-durable deluxe cargo box ensures hard-working performance. Climate control comes standard in the factory-installed cab. *Offer valid from March 1st, 2019, through April 30th, 2019. $300 retail bonus available with purchase of any new Mid-Size and/or Full-Size XUV Series Gator UV from an authorized John Deere dealer. Must present this completed, official Great North American Test Drive Request form to an authorized John Deere dealer at the time of purchase. 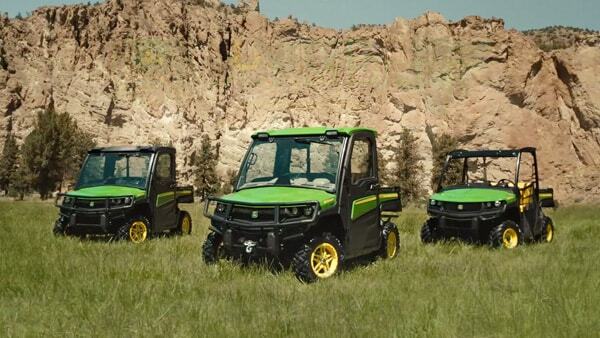 Available at participating John Deere dealers. Dollars off will be deducted from the purchase price. Limit of one form per person per purchase. See your John Deere dealer for further details.